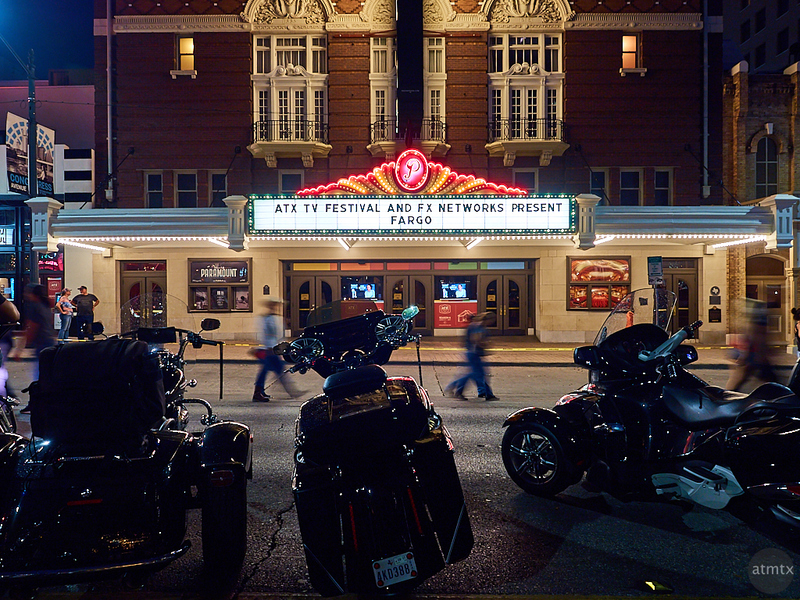 I caught the Paramount at a lull, just after the ROT Rally Parade. What is usually a jumble of people cluttering the scene, I amazingly captured a blur of people exactly spaced between the bikes. It almost gives a staged appearance to the photograph. Rest assured, it was pure luck. This is another one of those single image shots hand-held to optimize the dynamic range. With relatively little light coming from behind me, the motorcycles are rendered mostly as silhouettes. But I prefer it to the ultra-busy scene from yesterday. It’s odd how quiet the scene looks, because all around me, there were loads of people and bikes. Goes to show that with selective composition, you can give a distorted impression. Shot with the Olympus OM-D E-M5 Mark II and the 12-40mm f2.8 Pro lens. Handheld at 0.2 seconds at ISO 200. A real movie. With a marquee! We have a few — but not many. A couple in Boston and Brookline. Out here, we have two drive ins, one preserved, one just OLD. I think NY has more. It would be a fun photographic exercise to go shoot these old theaters throughout America. I know the guy who shoots all the old diners. He’s got a couple of books out and they do pretty well. if no one IS doing it, you could and probably make some money with it. People REALLY love old movie theaters. I’ve written about a couple of great ones in New York and they got a lot of attention. And I didn’t even have new pictures … I had to use whatever was available online. That’s the key. Doing stuff that others aren’t doing.